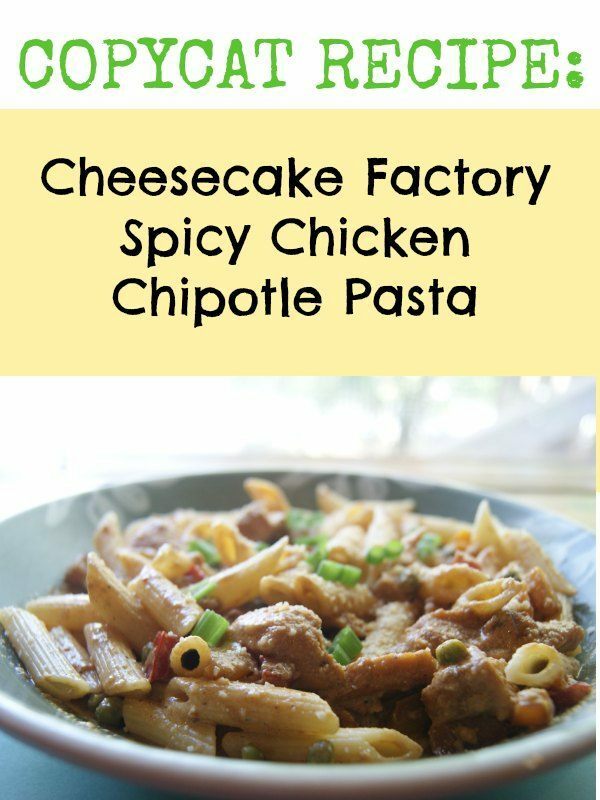 This is a popular dish at The Cheesecake Factory, you know, after the all-important cheesecake, of course. After a few tries I think it’s pretty close, it’s not too difficult to cook, and just a few dishes to dirty-got to love that. While it is a bit of a long shopping list, it is totally worth it for the fantastic flavor this mix makes. Prepare 8 oz. 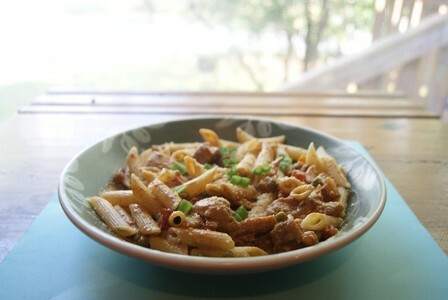 penne noodles according to package directions, drain and set aside. Begin by chopping your chicken into bite sized pieces. Place in a bowl or large Ziploc bag. Squeeze the juice of 1 entire lemon over top of chicken. Add 2 Tbsp. of honey. Mix well to coat, set aside to let chicken marinate. 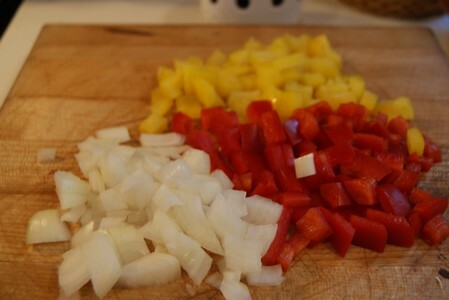 Dice your onion and peppers into small pieces. Drizzle olive oil and a Tbsp. 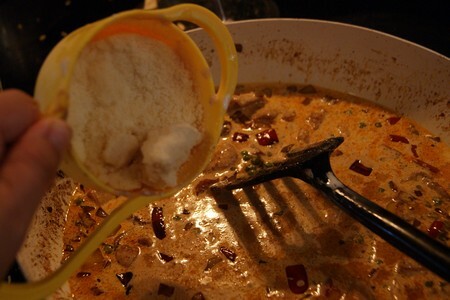 of butter into a large saucepan, pour in chicken and marinade. Spread out and cook over medium heat until all pieces are thoroughly done, flip chicken to cook both sides. Remove from pan and set aside for now. Using the same pan, add in a little more olive oil, sauté onions and peppers until onions become translucent. Add in garlic and cook for 1 minute, add 1 Tbsp. honey. Add peas to pan, and cook for 2 more minutes. Here is where the delicious spiciness is added, add 3 Tbsp. of chipotle in adobo sauce (just the sauce don’t use the big peppers, at least not for this recipe) You can add more or less as your taste preference. Now stir in 2 cups half and half, and 1 cup of parmesan cheese. Turn to low heat and let sauce simmer and thicken for 5 minutes. Toss penne and chicken in with sauce until well mixed and coated. Top with cilantro or I like to dice green onions and sprinkle on top for a bit of freshness. Enjoy! Prepare pasta per directions on the package. Drain and set aside. Chop chicken into bite sized pieces. Place in a bowl or large plastic bag. 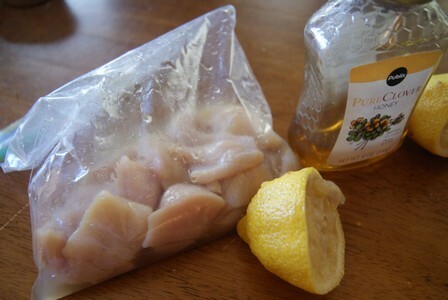 Squeeze the juice of one entire lemon over chicken. Add honey. Mix well to coat. Set aside to allow chicken to marinate. Dice onions and peppers into small pieces. Drizzle olive oil and one tablespoon of butter into a large saucepan. Pour in chicken and marinade. . Spread out and cook over medium heat until all pieces are thoroughly done, flip chicken to cook both sides. Remove from pan and set aside for now. 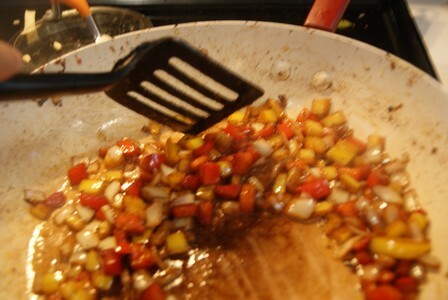 Using the same pan, add in a little more olive oil, sauté onions and peppers until onions become translucent. Add in garlic and cook for 1 minute, add 1 Tbsp. honey. 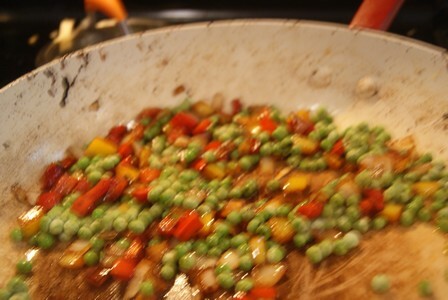 Add peas to pan, and cook for 2 more minutes. Add 3 Tbsp. of chipotle in adobo sauce (just the sauce don’t use the big peppers, at least not for this recipe) Add more or less as your taste preference. Now stir in 2 cups half and half, and 1 cup of parmesan cheese. Turn to low heat and let sauce simmer and thicken for 5 minutes. Top with cilantro or diced green onions. This was EXCELLENT! 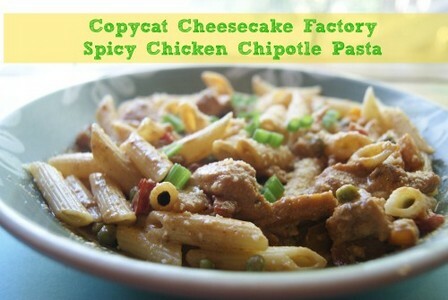 we loved it, were looking for a good make at home version of this recipe for a while and this was awesome. Thank you!